This beautiful country house with its own private swimming pool sits in three acres of grounds in the heart of the beautiful Dordogne countryside. It has recently been restored to a very high standard and all windows and doors are solid oak. 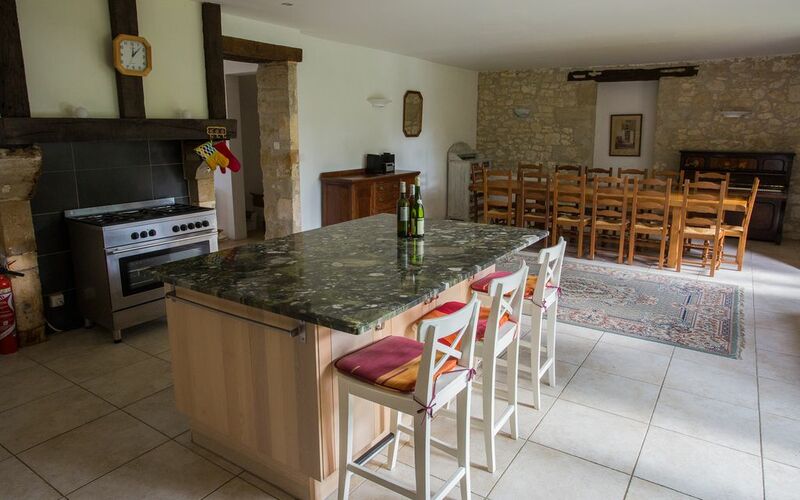 Totally private and independent from any other properties, Faugereau is just twenty five kilometres from Bergerac airport and three kilometres from the quiet market town of Lauzun. Our sole aim has been to make it the perfect venue for a relaxing holiday. Tom and Maggie sold their herd of Large white pigs and their smallholding and moved to France in 1990 with their two sons, three year old Ben and 10 month old Matt. Wherever have the years gone. Restoring property and winters skiing in the Pyrenees, that's where. To many of our friends and clients, Faugereau has become their very own special corner of France. Why not make it yours too? We bought Faugereau in 1999 and finished restoring it in 2008. The house has everything you could wish for, because we built it for our retirement. A beautiful stone fireplace that I built myself in the sitting room; and a kitchen big enough to swing a tiger round in, when she'll let me. Of course as soon as it was finished, we promptly changed our plans, and built a new house in the next parish. So come and reap the benifits and spend a relaxing holiday in a house that was designed, to be lived in as a proper home, not as a cheap holiday let like so many other properties. Outside, there is peace and quiet on the huge covered terrace, loads of flat lawn to play games on,and a sunny pool with shady trees to sit under, or drag your sunbeds to if it gets too hot on the paving round the pool. Separate bathroom next to bedroom 1, shower/wc/washbasin. En-suite bathroom- bedroom 2, shower/wc/washbasin. En-suite bathroom- bedroom 3, shower/bath/wc/washbasin. En-suite bathroom- bedroom 4, shower/wc/washbasin. Family bathroom bath/wc/washbasin. The sitting room has a magnificent stone fireplace, bags of character and 3 comfortable sofas and 2 chairs where you can relax out of the sun. Cooker, fridge freezer, dishwasher, microwave, hand held food blender, ample quantities of crockery and cutlery. Tombeboeuf, 9 holes, 20 minutes away. Castelnaud, 18 holes 35 minutes away. Chateau Des Vigiers, 18 holes 40 minutes away. Outside: There is a large covered terrace which overlooks the swimming pool where you can eat in the shade. The private swimming pool is 11 X 5 metres in size, and has a Roman end which has steps that lead down into the pool, making easy access for children and the less mobile guests. There is set of boules, and table tennis and volley ball set up in the garden. Utility Room: Washing machine, ironing board and iron. Second fridge. Cleaning / Towels / Linen / Maid service: Bathroom towels and bedlinen are included, beds are made up for our guests arrival. If you wish to have someone to come in to clean for you while you are in residence, this can be arranged but will be extra. Other: The sitting room has French windows that lead out on to a large covered terrace which overlooks the swimming pool, and where you can eat in the shade. The lovely villa had everything you would want for a family holiday our party ranged from 18months to 70 years. Beautiful house met our needs perfectly - plenty of room to absorb 3 families with teenagers for a week, and with no neighbours to disturb or be disturbed by. We ate every meal at the outside table which was always beautifully cool and welcoming. Well-equipped bedrooms each with an electric fan (which was much needed - although we couldn't find one for the downstairs bedroom). Difficult to fault, and Tom's recommendation of canoeing at Beynac was much enjoyed by all. Great size house for large family holiday. Large house for large family, 7 adults and 6 children. All rooms were a good size, especially the kitchen diner and living room. The garden was large with badminton nets which we all took turns at playing when we weren't lounging by the swimming pool. The house was situated in a very quiet area, not many other houses nearby. The nearest town, Lauzun, was a very short drive away with nice park. Street market was worth visiting as were the markets in other near and far towns and villages. The owners Tom and Maggie were very polite and helpful when making our booking and went above and beyond to help solve a problem with lost property. I can certainly recommend this house for a family holiday and will definitely return in the next couple of years. Faugereau was an impressive house that suited our needs exactly. We used it as a retirement party with family and friends staying over a month. Tom and Maggie were great hosts. The house offered good size bedrooms and bathrooms in good decorative order. The pool and garden gave us all the outside entertainment space we needed. The BBQ was certainly taken advantage of. A great stay and would not hesitate to stay again. Our party of 13 had a wonderful time staying at Faugereau... we were a family group of grandparents, children and grandchildren and everyone had a fabulous time! The house is very well equipped and had plenty of room for us all. Wonderful location with beautiful sunflower fields and lots of lovely villages to visit. The pool was excellent and perfect for the small grandchildren who spent most of the day in it! The garden area is great for adults wanting to relax and loads of space for the little ones to run around in. Great outside eating space out of the sun! The owners are very helpful and have a huge amount of knowledge of the area. If you are looking for a family house look no further!! Smart, comfortable,extremely well equipped, house in the country with no neighbours to worry about with excited children in the pool, all set in a delightful region of France. This description fails to do justice to the property or the fabulous holiday we spent here. If you are in a family party then look no further. Many thanks to Tom for his attention too. Biscarosse and Arcachon are both beautiful beaches that are popular with surfers, and are two and a half hours away. Bonnet is 7 - 11 hours drive from the Channel ports St. Malo/Le Havre/ Cherbourg/Calais. Flights into Bergerac include: Ryanair fly in from Bristol/Liverpool/London StanRyanair who fly in from Bristol, Liverpool, London Stansted, East Midlands, and Brussels-Charleroi. Flybe fly in from Birmingham, Edinburgh, Exeter, Southampton, and Leeds Bradford. Transavia fly in from Amsterdam-Schiphol. There are also flights arriving at Bordeaux and Toulouse. Lauzun is 4km from Faugereau, Castillonnes is 10km away where there is a good supermarket, several bakers and butchers, and even a cinema, alternatively there is a larger supermarket at Miramont de Guyenne, 15 minutes away. Bergerac is 20 minutes away from Faugereau. There are a wealth of Chateaux and caves to visit, wine tasting, canoeing on the Dordogne, horse riding 10 minutes away, tennis at Castillonnes, and bastide towns to visit. Booking Notes: Our prices are in euros. 25% Deposit on booking). 75% balance in euros, due 75 days before arrival date, a breakage deposit of £250 or €300 will also be due with the balance. An extra bed can be arranged (maximum 15) but there will be a surcharge of 20 Euros per person per night. Changeover Day: The changeover day is Saturday, the time our guests are expected to arrive is 4pm, and to vacate the house by 10am the day of their departure. Notes on prices: We do ask for a breakage deposit of £250 due with the balance. An extra bed (maximum 15) can be added, but there is a surcharge of 20 euros per person per night, (babies under the age of one are free). A Tourist Tax has been introduced in France which will be due along with the balance, this is 40 centimes per person over 13 years of age, per day.